Ovum shares best practices for customer communities. Customers have access to public forums everywhere. They can easily share when their expectations are exceeded or not met. 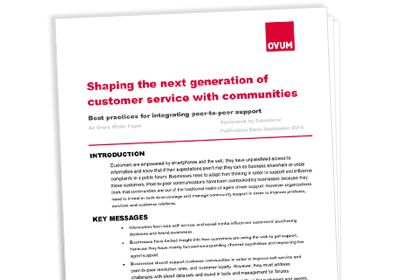 In this Ovum white paper, see how community interaction can improve the overall brand or business experience by providing a self-service, peer-to-peer resource that empowers customers to take action before it hits public forums. The result is higher rates of customer happiness.